We are proud to announce the family of simulator adapter modules designed to simulate input signals and display output signals on the GE Fanuc 90-30 and 90-70 Programmable Logic Controller. Although, originally designed for training, simulator adapter modules can serve as an excellent tool for sales presentation, application development, and on-site startup. The modules have been designed to make the training equipment less expensive and more mobile. Four adapter modules, simulating discrete and analog inputs and displaying status of discrete and analog output signals, for most cases eliminate necessity of using the Series 90 Universal Simulators for training. And, by the way, this is done at a fraction of the price of the big simulator box… For GE Fanuc Training Department this means savings in both capital costs and shipping expenses. Discrete Inputs Simulator Adapter (KR697SIM651) provides discrete input signals simulation for the 32 TTL Inputs module IC697MDL651. Discrete Outputs Simulator Adapter (KR697SIM753) displays status of discrete outputs on the 32 Points 5 48 V Outputs module IC697MDL753. Analog Inputs Simulator Adapter (KR697SIM230) provides two analog input signals simulation for the Analog Inputs module IC697ALG230. Analog Outputs Simulator Adapter (KR697SIM320) displays status of two analog output signals of Four Channel Analog Outputs module IC697ALG320. The adapter module is mounted on the 90-30 backplane and it takes one slot on the PLC. The simulator requires +5V power which is taken directly from the backplane. The modules are connected to the front of a corresponding input and output module. 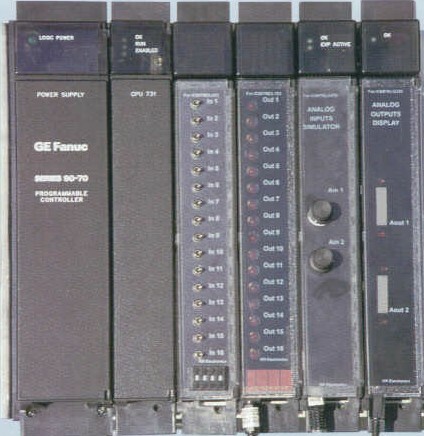 So if you have a 90-30 demo with the right I/O modules and 3 empty slots, the only thing you need for your presentations and training is the 90-30 Simulator Adapter Set. Discrete Inputs Simulator Adapter (KR693SIM654) provides discrete input signals simulation for the 32 TTL Inputs module IC693MDL654. Discrete Outputs Simulator Adapter KR693SIM752) displays status of discrete output signals for the 32 Points 5 48 VDC Outputs module IC693MDL752. Analog Combo Simulator Adapter (KR693SIM442) provides one analog input signal for an analog input module and monitors one analog output channel in an analog output module.